What’s the recipe for being the best soft-sided cooler? The best soft sided coolers blend usability with durability and insulating properties. The best soft sided cooler is not the one with four or more ice cubes remaining after a multi-day ice retention test. But rather, the best soft-sided coolers are the ones who perform well in a variety of places – in the boat, at the beach, on the mule and on the run! Bottom line- most people use soft sided coolers for shorter trips. You don’t need ice to last three days if you are spending a day @ the lake, in the river or on the road. You look for design, durability, usability, ruggedness, insulating properties and affordability. Do you really want to carry a cooler that weighs twenty (20) lbs. when it’s empty? 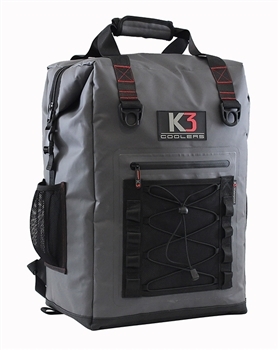 We didn’t think so, thus the introduction of an ultra-rugged and an over-achieving premium soft sided cooler series by K3. Constructed with heavy-duty scratch resistant waterproof & UV protected Tarpaulin 1000D PVC, our exterior shell resists wear, tear & abrasion. The 5-layer Dual Temp Insulation will keep your food & drinks hot or cold for days while the TPU interior RF welded liner keeps the liquids inside-no sweat, no leaks! Waterproof up to the zippers. It’s ready when you are…….for adventure- whether you are on the bike, the boat, the hike and/or the beach. Built tough by K3! •	Reinforced double stitch seams & haul handles – built for adventure! •	Heavy Duty YKK zippers ~ stand the test of time. •	Exterior side storage compartment for quick access: keys, cash, spf, phone & more. •	Did we mention style? Design? Durability? Affordability? Cool? WOW! For best results with any cooler, start with cold beverages and cold ice. If you take a bag of ice which is already melting and throw it over 20 cans of room temperature or soda, you are going to use majority of ice transitioning the warm cans or bottles to a cooler temperature. If you must start with warm cans, think through adding some ice along the way…..